The resilient and durable characteristics of ceramic tile flooring make it ideal for any busy household. If you are interested in a new flooring solution able to withstand frequent spills and an active household, then tile may be the perfect option to replace your old flooring. Our flooring store is proud to offer local homeowners an impressive collection of ceramic tile in Simcoe, ON. With the help of our knowledgeable in-store associates, finding the perfect tile for wet areas, like the kitchen and bathroom, or the entire home is now easier than ever. Improve the appeal of your home by installing durable and designer tile today. There are several reasons to consider ceramic floors. Each ceramic floor tile is manufactured for maximum durability, providing a strong flooring surface that endures for many years. This type of flooring is also ease to clean and maintain. Dirt, dust, and hair will have no place to hide in any room that features new ceramic tile flooring. By occasionally sweeping and mopping your floors, they will continue to look like new. In addition to their functionality, the ceramic tiling we offer is available in a multitude of different styles. From the color patterns to the overall texture, you can customize your new tile floors to your liking. Let us know if you need assistance choosing the look of your new tile floors, and we will lend our professional expertise. Our associates have experience matching new floors with existing interior décor, so we know how to outfit your home accordingly. When installing new tiles, the placement must be exact, otherwise the flaws are obvious. This requires cutting with a wet saw, as well as using the right type of mortar to hold the tile in place. Then, there is the precision required in grouting. All in all, it is much wiser to trust us to arrange for flooring installation. Placing tile is a time-consuming task best left to true professionals. 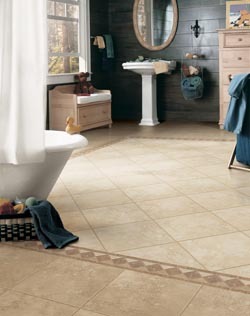 Improper installation often results in loose tile and other issues that compromise your floors in looks and longevity. Rely on us to get the outcome you desire. Our installation professionals are highly skilled at tile floor installation. We are so confident in their skills that we back every completed installation with a lifetime warranty. As soon as you walk into our store, you will be treated with the utmost courtesy to ensure you receive the assistance you need. Our friendly and knowledgeable team is standing by to help you find the type of ceramic floor tile you are looking for. Just let us know what your price range is and if you have a specific style in mind. We can also answer any questions you have regarding tiling and how it functions in day-to-day situations. We are confident you will be 100% satisfied with your purchase when you come to our flooring store in search of high-quality ceramic tile. Contact us today to request ceramic tile installation. We proudly serve customers throughout Simcoe, Ontario, and the surrounding areas.